The heat was on. Thermometer said 101F. The need for the endorphins registered higher. Matt and I rode up at a steady pace. We were joined early on by Joel. 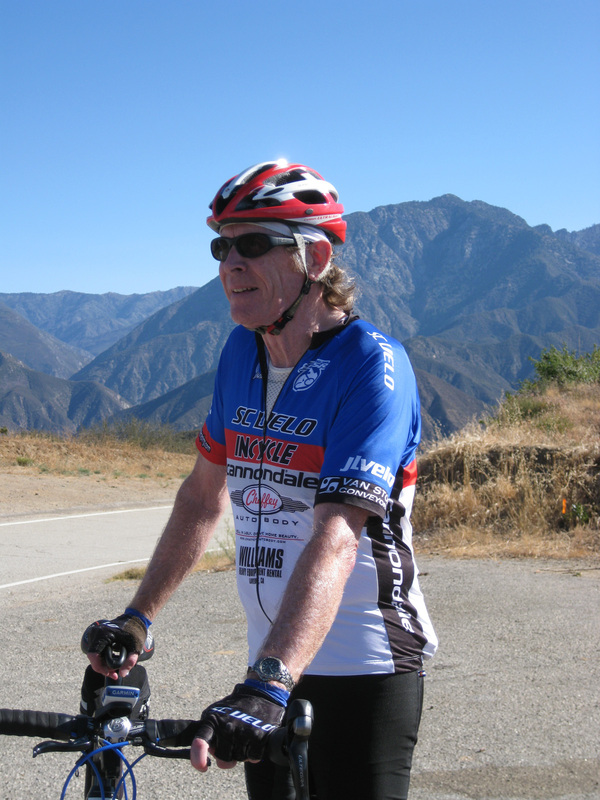 It was his first ride in six months and he soaked up the miles barely breaking a sweat. Good company. Lots of chatter to free the mind to pedal. The tempo with Joel and Matt was good, a bit of a challenge for me, yet doable. My "new" bike performed nicely. Thank you Incycle! The annoying pedal squeak was gone. The shifting was fluid. The chain well lubed. 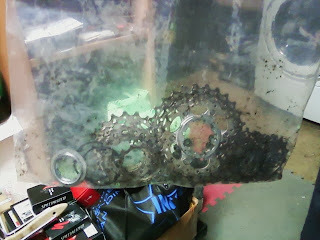 As for the new ratios of the cassette, the "16" was not missed at all. I didn't need the 28, but tried it anyway for giggles. I will save it for the hard climbs. The others are same so no need to relearn or retrain the legs. Did I use the 11 on the downhill? I didn't notice. 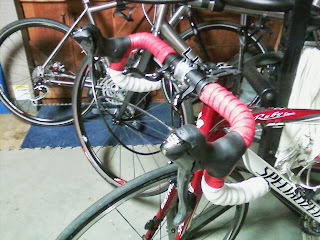 The wrists appreciated the plush Lizard handle bar tape. Good to get the heart beating. The new 11-28 cassette. the ratios for thus ultegra CS-6700 cassette inclue 11, 12, 13, 14, 15, 17, 19, 21, 24, 28. the 28 will come in handy on the hard climbs. And yes I have a triple in the front. New bicolor handle bar tape. Two tones look nice. The four year old cassette. Bye Bye. Alot of great rides happened with you. Bike Tune Up. Got a new chain and a new cassette on the bike. 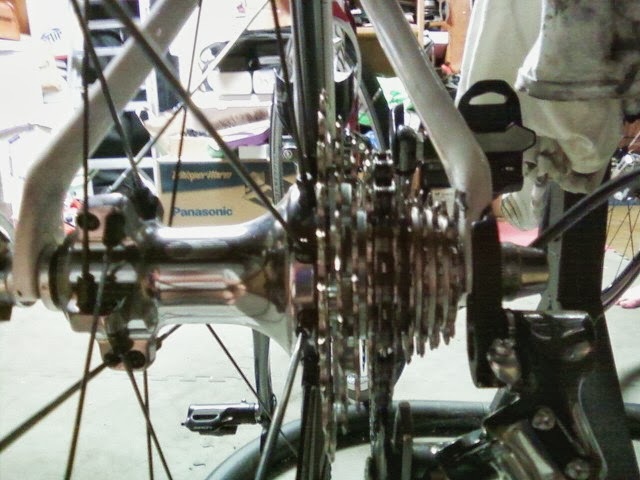 Hope to try out the gearing ratio. 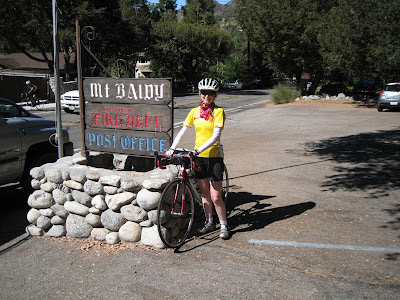 Rather than racking up the miles to Baldy, today was riding and connecting with people. I needed the comfort of people. Dave and Mary on the tandem had music playing. Dave and Mary along with their friend Ron were good company on the push to the shed. Matt and Ron rode with us awhile before pushing on. Mike and his coworker Dave were stopped at the shed. 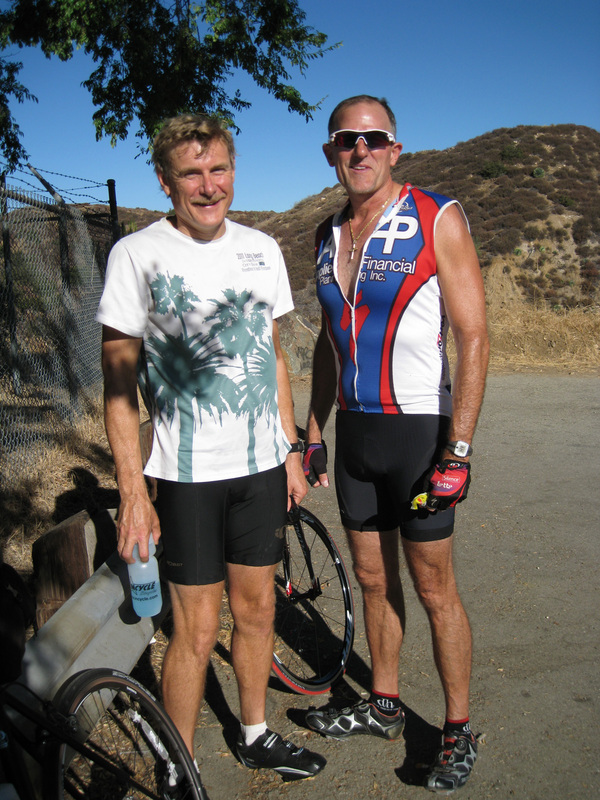 Bill joined me at the shed and we headed out for a couple more miles on GRR. Matt on his return trip from Peacock Saddle joined us to ride to the Experimental Forest Sign on GRR about Fork+2.5. 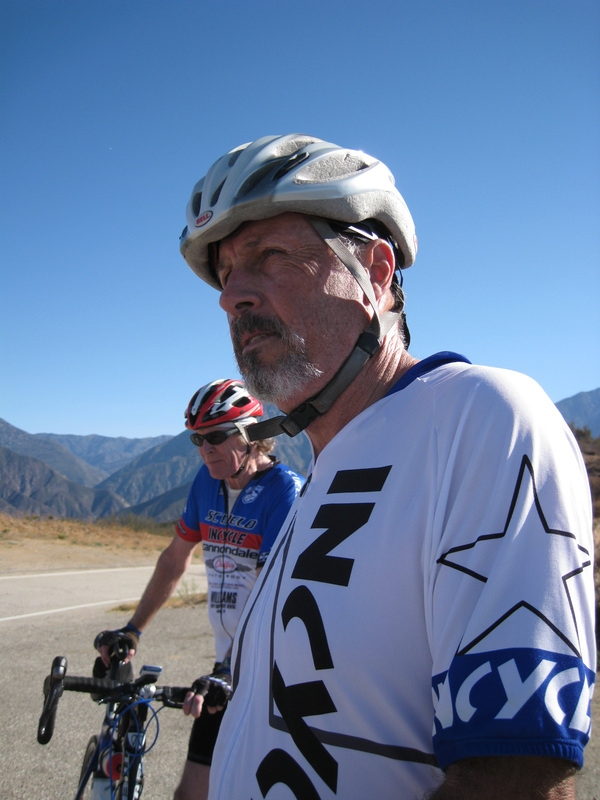 The three of us stopped to look at Tanbark and enjoyed the view, when Rick and Greg rode up. They had stories of fish and bears and office moves. On the way back, Ron rejoined on us on the downhill trip home. It was good to focus on others today. Major happenings at Newmans with Law Enforcement. Matt photoed the burn area set by a homeless man last night. 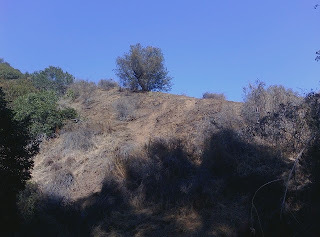 The photo shows the dead area of hillside. The fire fighters quickly extinguished the fire. I heard the helicopters last night. The view at Newmans. From Bills ride. The day was heating up fast and my attempt to leave earlier than last week turned into 2 minutes sooner. We spotted John's truck early into the ride. The goal of the day was to catch John somewhere on the mountain. 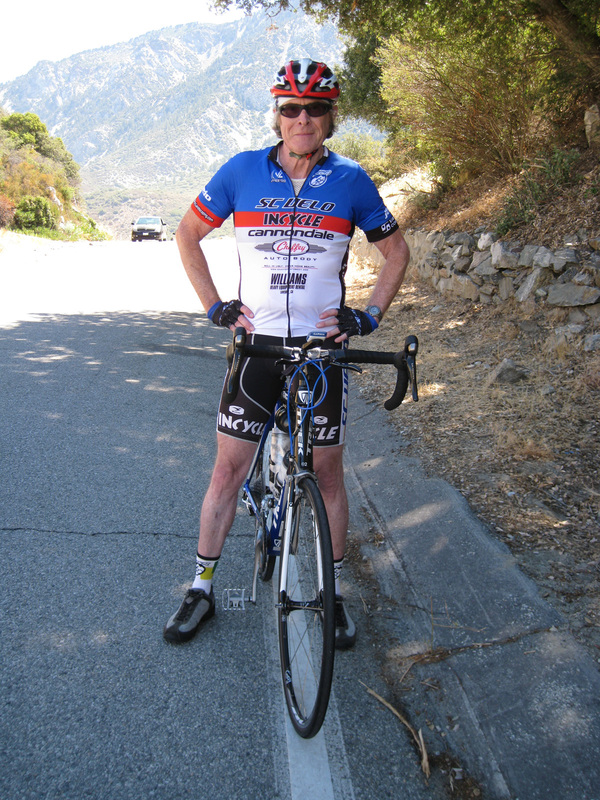 I pushed on parting with Bill near the first hair pin turn, aka Bottom of the Monroe Truck Trail. The clean chain felt better than last week's. Easier forward motion. 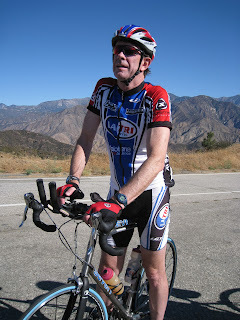 Pedalled past a couple on a tandem bicycle with California State Bear Jersey's on. I watched the cadence of the rear rider, a female as she stretched her leg out fully with the down stroke. I joked with the rear cyclist as I approached. "He needs to pay you more to push him up the hill?" They both laughed. The lead rider looked at me and asked, "How much did she pay you to say that?" Those thirty second jokes propel you a bit faster. Approaching Kevin's Corner at 10.6, I surveyed the tier of road below. I made out the GRRR Kit on Matt riding with Bill. I pressed on. The legs felt better than last week. Mentally I knew I could make it to the Village and back. A few cyclists on the road. Matt caught up with me before the shed. We stopped to see the OTS Vehicle at mile marker 5. The driver of the vehicle paced back and forth and worried about the cost of the tow truck. Matt told him "Dude, you are so lucky. Your car is only 30-40 feet down. You're alive and walking around. There's another car over the side and the driver died. Life is good. Its only the cost of a tow truck." I left Matt to chat and get a bit of head start. He quickly caught up with me. About Fork plus 3, I thought I saw a wave of furry animal headed down the hillside. Matt did you see that? He went back to investigate as I pushed on. Again he caught me quickly. No squirrels with pine cones on the road. The Reward climb started slow. The heat was 10 degrees hotter than last week. The first part is in shade. At the turn at GRR 6.0 where apart of the wall was missing. A pile of dirt filled in the gap of the wall but looked too much like a launch ramp. Two Angeles National Forest trucks were parked. 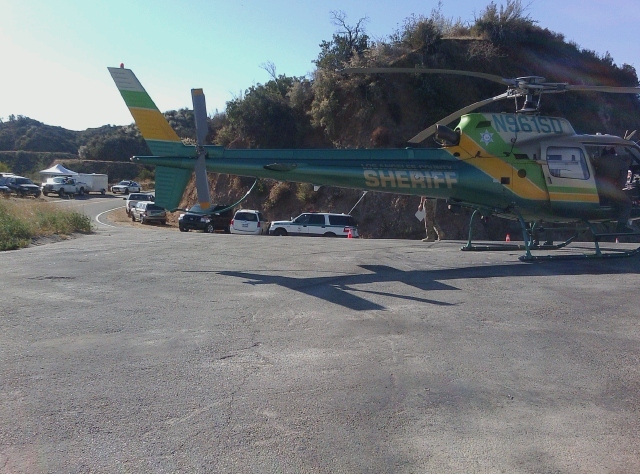 We thanked the rangers for the quick work putting out the fire from the 12:35 am crash. 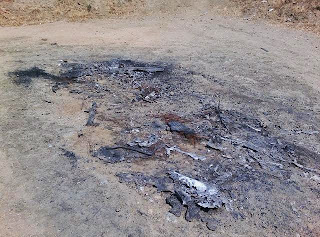 The car was 1500 below. The passenger had been ejected from the car which saved her life. The driver did not survive. Matt staid and chatted with the rangers. "Do you know about the tow truck? Let me show you the photo." The rangers needed to be there as they pulled the car up from the first incident. I saw another time opportunity to get a jump start and put in the miles. The ride turned hotter, the air thinner. The "flatter" part at mile marker 7.5 spurred me on. Matt caught me again before then. He talked of three cyclists riding with him who stopped as one had cramps. The sun heated the thin air. The reward of the downhill at mile marker 8.4 was glorious. 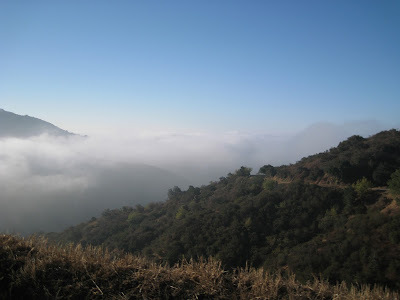 We quickly covered the road to cow canyon saddle. 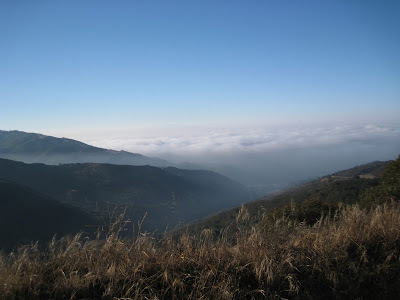 then stopped for pictures of the valley to "Upland". Found John at the Lodge cheering for the racers time trialing to the ski lifts. Drinks. bars. chatting. Water. Matt, John and I headed back. The view was amazing. 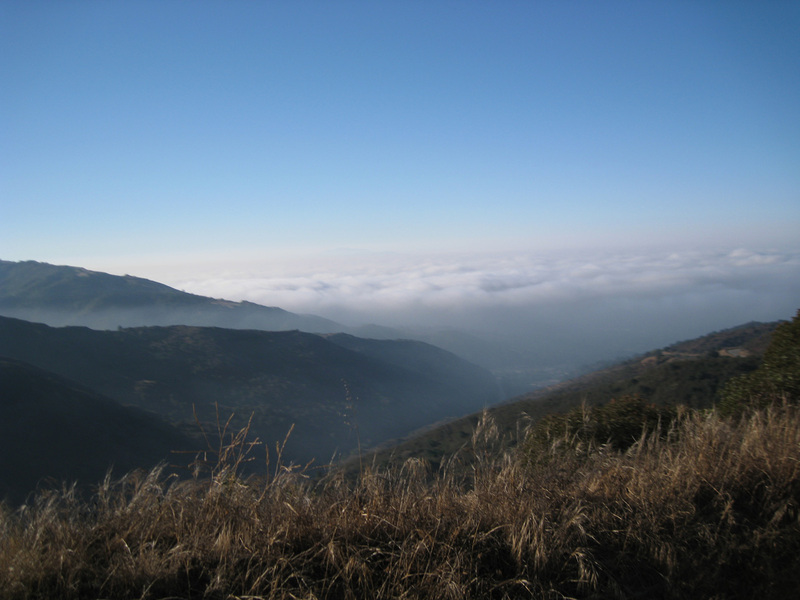 Looking out across the sky over the top of the muck, Catalina island and San Clemente could be seen. Matt zoomed ahead at the return to Fork plus four. 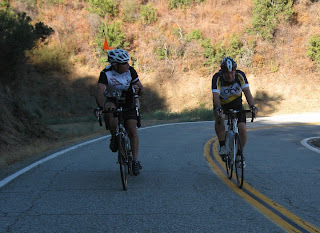 John really laid down the hammer on the climbs back from the village. I kept up. The climb up the hill at the fork, I surprised John with a fast cadence and flew ahead only to be out of gas moments later. John mentioned the road was closed on Wednesday for a Kowasaki motorcycle filming. With the climbs done. Downhill to the car. The wind rose hot from the valley. Good to have the sweet sweet relief of downhill to cool off the nerves. Second trip to Baldy completed. Yipee. Cloud overcast chilled the air as Bill and I left at 7 am. Spotted John's truck and wondered if I would see him today. 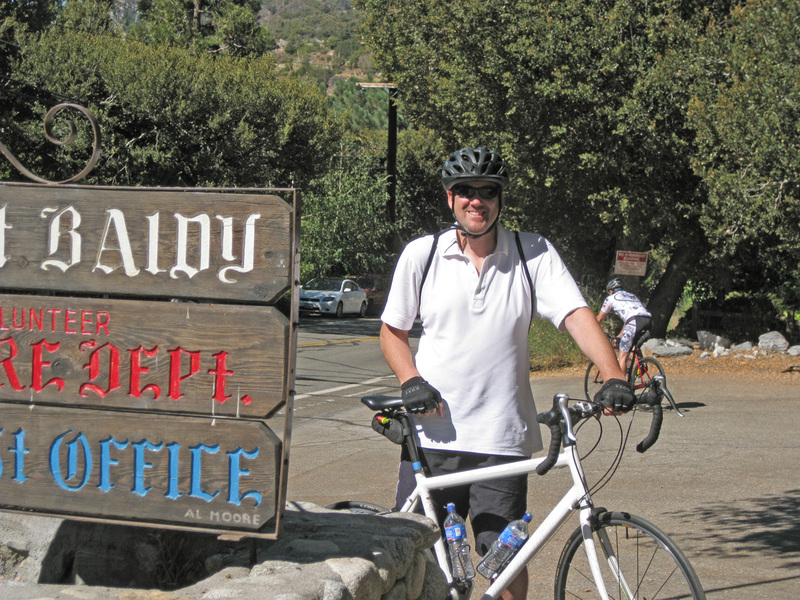 My goal was to ride to Baldy. Same goal as the previous four to five weeks. But this time, I had no time constraints. This time I had the solitude of commitment. This time could be the first time this year for me to put in the miles. Last week's ride was so close and yet so far, stopping four miles from the Village. There were micro stories along the route. One rider with sandals and a blue shirt trundled up the hill and I gave her words of encouragement. The birds were fat and looking for food, darting in front of my wheel then flapping out of the way. A rabbit had jumped into the road and quickly turned back into the shrub. Hunters sitting in chairs scoping out the terrain at GMR mm 7. Inland Inferno Riders were out in force. One commented about my kit, The infamous yellow jersey. I chuckled. Short stop at the shed. No sight of John. I wondered as I moved onto Glendora Ridge Road if I would see him or if he went to East Fork. I had twelve miles to ponder that question. At Fork plus 3.5 a squirrel had dragged a pine cone out to the middle of the road. 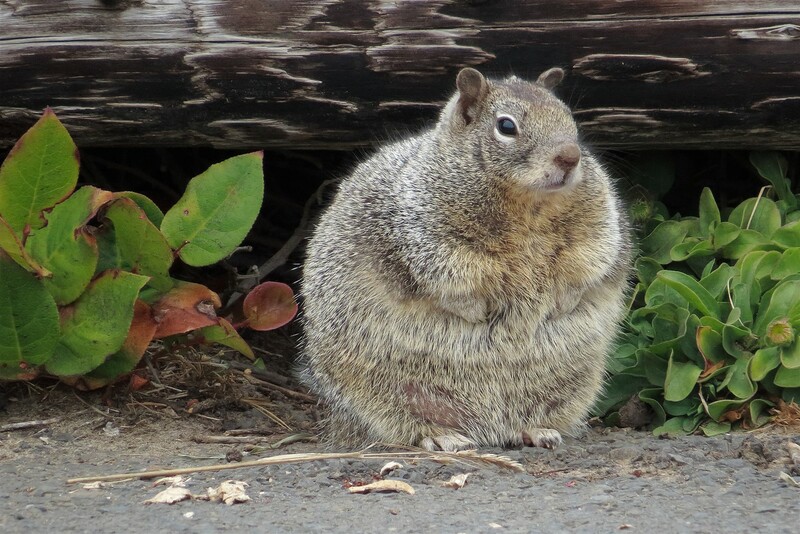 Squirrels never make up their minds until the last moment. It ran to the side farthest from me. Perfect. I wondered if I should have thrown the pine cone to the side as I sped away. I took the long hill called the reward climb pedal stroke by pedal stroke. I did my best to keep the average speed near my goal. Two Zombie riders spoke words of encouragement stating, Looking Solid. I am still moving, I replied and chuckled. They flew by. They looked better than solid. Good amount of shade on the way up, being early in the day. After the corner at GRR+6, the sun was bright and warm, while the air thinned with the altitude. I had my time goals. Calculated my average speed in order to make those time goals. My tail bone complained from the fall I suffered in March. It spoke with warm darts, noticeable. stop complaining I told my various muscles. we are going. Glutes, Knee, tail bone, get on board. The downhill at GRR+8.4 never felt so good. It was a bit of a race to see if I could do the last four miles in under 17 minutes. I made it to the Village right at 10 am on the dot. Hooray! First time for the year! Made my time goals. Hooray! Made my distance goals. Hooray! Hint to self: I need more cycling during the week. I headed for the post office to sit and eat. I had given up seeing my friend, when I spied John headed out at the Post Office. John! Recouped, and photoed we headed to the visitor's center which was closed today. doh! The store by the Lodge was also closed. What's up with that? I bought a Cliff bar at the Lodge. Bill arrived in the Village. He and I bought powerades from the machine. 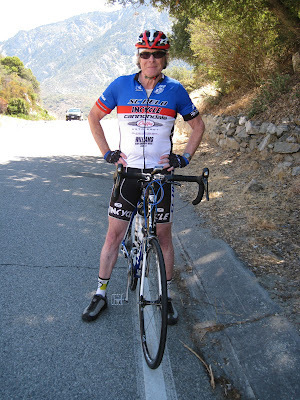 The rider with the blue shirt and sandals pedaled past. Back to the Post Office to dilute the powerade with water. Spent 43 minutes in the Village. Spent $3.50 on drinks and bar. It was great to have John's company on the way back. The slug up to Cow Canyon Saddle was slow. Lead in my legs. Glad to get the miles completed. 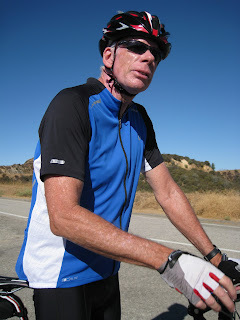 John had stories of riding without contacts only to miss a three foot rattler by inches. John had a theory about the squirrel and the pine cone. He thought the squirrel was smart hoping that a car would crush the cone releasing the tasty bits. A bit of wind on the way back. The smell of forest fires from far away hinted in the nose. Overall, Good ride. Confession. I had pizza for lunch. It was an impromptu celebration of a colleague's coupon. The works on a thin crust. Very tastey indeed. Three slices. Plus a slice of apple pie and salad. 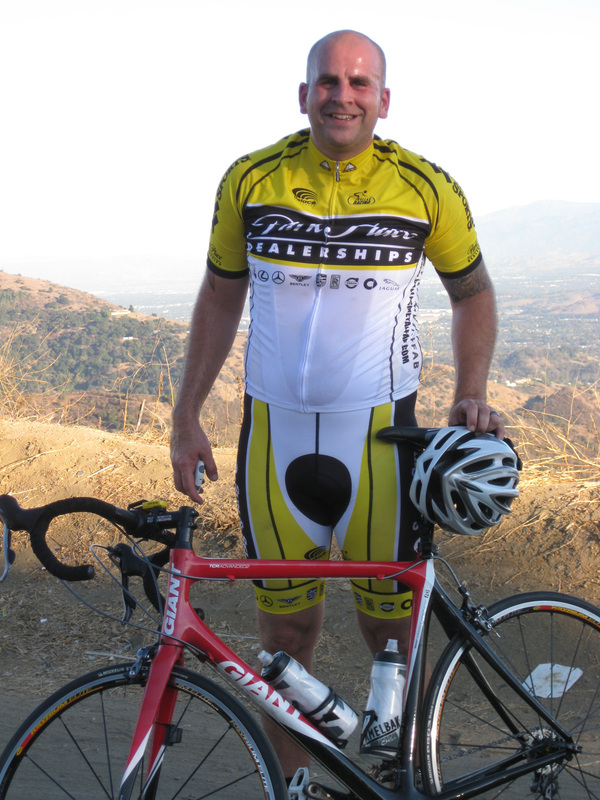 It fueled my resolve to cycle. Saw John's truck on the way up. A shout out to Heather and Joan flying downhill. Met Ariel (pronounce this like Aureal) on his second trip up the hill. Kept up with him for three quarters of a mile. Good incentive to kick it up a notch. Nice chat. Both agreed that GMR is a sweet ride in our own "backyard". Hoped to see John so I pushed to mile marker 8.27. Ran out of time. Stopped at first saddle and met up with Dale and Ella. Awesome. They are riding 100 miles per week. Sweet. Dale asked me the 64,000 dollar question. "Are you keeping up your blog?" One word at a time. Found a website: Fat to Fit at 44. Pretty inspiring.